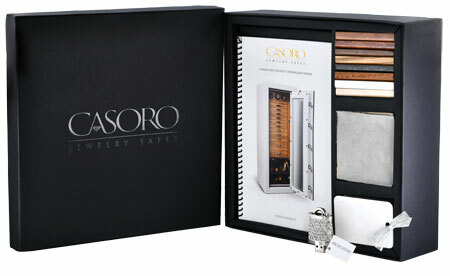 Introducing the Casoro Jewelry Safe Design Kit – the perfect resource for creating your own elegant and secure luxury jewelry safe.The Design Kit comes complete with the Casoro Design Booklet to walk you through the design process, and samples of the rich paints, exotic woods, and ultrasuede fabrics. As a bonus, you will receive your very own keepsake lock pendant that doubles as a USB drive, filled with an inspirational gallery of jewelry safe combinations. The Jewelry Safe Design Kit will have you on your way to making your one-of-a-kind creation a reality. We will charge $150, which will then be applied toward your safe when you purchase (we will call you for the remainder of your CC info).